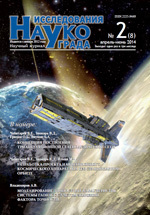 The paper presents the results of analysis of accuracy factor values, transmit in navigation message of GLONASS system. An algorithm for usage accuracy factor values in navigation task solution is proposed in the paper. Accuracy characteristics of GLONASS system are simulate with use of the algorithm. Vladimirov A.V. Simulation accuracy characteristics of GLONASS system with a glance accuracy factor values // The Research of the Science City, 2014, no. 2, pp. 24-26.